This is the first game in the Ballblazer series. For other games in the series see the Ballblazer category. Ballblazer is a 1984 computer game created by Lucasfilm Games (later LucasArts Entertainment). It was originally released for the Atari 8-bit systems, such as the Atari 800 and the Atari 5200. It was also ported to other popular platforms of the day, such as the Apple II, Sinclair ZX Spectrum (by Dalali Software Ltd), Amstrad CPC, Commodore 64, Atari 7800, and the Famicom. The Atari 800 version was called Ballblaster during development - pirated versions of the game went by this name as well. The principal creator and programmer of Ballblazer was David Levine. Ballblazer was the one of the first two games ever developed by Lucasfilm Games, the other being Rescue on Fractalus. They began life as a collaboration between Lucasfilm and Atari. Ballblazer is notable for two technical accomplishments. One is the use of anti-aliasing to blur the edges between the two different shades on the grid and make the visual effect of the grid much smoother. The other is the use of an algorithmically generated tune that is played during the game's opening theme "Song of the Grid," which makes the theme song different every time it is played, while still remaining in tune and in tempo with the background music. In 1990, LucasArts and Rainbow Arts released a remake and follow-up to this game, called Masterblazer. This game was released for the Amiga, Atari ST, and PC DOS. Years later on March 31, 1997, a remake of the original titled Ballblazer Champions was released for the Sony PlayStation. Ballblazer: the simplest, fastest and most competitive sport in the known universe. It grew from dark roots in ancient space war to become king of all games among every lifeform within range of Interstellar ethercasting, In exactly three minutes, Ballblazer can make you a hero—or destroy a lifetime of dreams. The top player possesses the Plasmorb while the bottom player jockeys for position to knock the Plasmorb away. Ballblazer is a simple one-on-one sports-style game bearing similarities to basketball and soccer. Each side is represented by a craft called a "rotofoil", which can be controlled by either a human player or a computer-controlled "droid" with ten levels of difficulty. (The game allows for human vs. human, human vs. droid, and even droid vs. droid matches.) The basic objective of the game is to score points by either firing or carrying a floating ball called the Plasmorb into the opponent's goal. 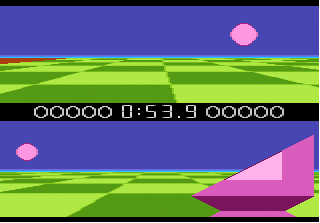 The game takes place on a flat, checkerboard playfield, and each player's half of the screen is presented in a first-person perspective. A player can gain possession of the ball by simply running into it, at which point it is held in a force field in front of the craft, known as the pull-field. The opponent can attempt to knock the ball away from the player by using the fire button to activate the push-field. The player in possession of the ball can use the push-field to fire the ball toward the goal. When a player does not have possession of the ball, his or her rotofoil automatically turns at 90-degree intervals to face the ball, while possessing the ball turns the player toward the opponent's goal, called the goalbeams. The goalbeams move from side to side at each end of the playfield, and as goals are scored, the goal becomes narrower. Pushing the ball through the goal scores one point, firing the ball through the posts from close range scores two points, and successfully scoring from long range (where the goalbeams are not visible) scores three points. The maximum number of total points between the two players is ten, meaning that any points scored that would take the combined total above ten will cause the opponent's score to be reduced by the same amount, resulting in a kind of tug of war scoring system. The game ends when either a player successfully scores ten points or the timer runs out. If time runs out and the score is tied, the game goes into "sudden death", where the first player to score wins. In order to understand how the controls for the Rotofoil work, you must understand the Rotofoil itself. The Rotofoil can only face one of the four cardinal directions; North, South, East and West. When it turns, it turns ninety degrees instantly. The player actually has no control over when and how the Rotofoil turns. If a player is not in possession of the Plasmorb, the Rotofoil will always turn to face the Plasmorb's position. If the player is in possession of the Plasmorb, the Rotofoil will always face the direction of the opponent's goalbeams. : Use the joystick to direct the Rotofoil in relation to the direction it is facing. Press up to drive the Rotofoil forward in its current direction. Press down to move the Rotofoil in reverse. Press left or right to make the Rotofoil strafe in either direction. : Press the button to activate the Rotofoil's push-field. If you are in possession of the Plasmorb, this will shoot the Plasmorb down field, and cause your Rotofoil to recoil in response. If your opponent is in possession of the Plasmorb, you must attempt to use your push-field to knock the Plasmorb loose from your opponent's pull-field. When a new match begins, or after a goal has been successfully scored, the players are reset to their starting positions on their side of the grid, and the Plasmorb is injected from one side of the grid or the other. The direction that the Plasmorb is injected is the same direction that the goalbeams will be initially moving. Once the Plasmorb is injected, both players can race towards it in an effort to collect it first. In general, you want to push up on the joystick to rocket the Rotofoil forward, while doing your best to strafe left or right in order to keep the Plasmorb ahead of you. If you advance too far, you will roto-snap in a new direction to face the Plasmorb. Your momentum will continue in the direction you used to travel, and you will have to build up speed in the new direction. For this reason, you will reach the Plasmorb faster if you manage to keep it in front of you while you advance. As noted above, pushing the Plasmorb through the goalbeams is worth 1 point. Shooting the Plasmorb through the goalbeams from a short distance away is worth 2 points. If you manage to shoot the Plasmorb through the goalbeams when they are so far away that they can't be seen from your current position, you earn 3 points. This is called an Over-The-Horizon shot, or OTH. An OTH shot is easier to do early in the game when the goalbeams are still wide apart. After each goal is scored, the distance between the goalbeams shrinks, making OTH shots much more difficult. The easiest way to perform an OTH is to back up while keeping the goalbeams ahead of you, and firing just before they disappear from the screen. By the time the Plasmorb crosses the goal, the recoil will have sent your Rotofoil back far enough for an OTH. When you are in possession of the Plasmorb, you can use the force of the push-field, and the recoil that it generates to your advantage. If you find yourself against the edge of the grid and wish to back up quickly, try shooting the Plasmorb forward and allow the recoil to push you back. The Plasmorb will also bounce off the edge of the grid and it should return to you. Shooting the Plasmorb forward when your opponent is directly behind you is a good way to crash into them and push them further back. Once you become more confident about shooting the Plasmorb into the goalbeams, you can attempt to take angled shots if your opponent is standing between you and the goal. To perform an angled shot, wait until the Plasmorb is to the far right or far left of your pull field, and shoot it. If done correctly, the Plasmorb will be fired at an angle that can bounce off the sides of the grid and around your opponent. Dribbling is a way to drive the Plasmorb down the grid without ever actually taking possession of it. If you approach the Plasmorb with your button pressed, your push-field will remain active, and you will dribble the Plasmorb forward. You should only attempt this if you are sure that you are properly facing your opponent's goal, or you might accidentally assist your opponent. Remember that in order to score, the Plasmorb must be in your possession first, so allow your pull-field to collect the Plasmorb before attempting to push it between the goalbeams. In order to steal the Plasmorb away from your opponent, you need to get very close to the Plasmorb before activating your push-field, in an effort to knock it loose from your opponent's pull-field. Come up alongside your opponent so that you are facing them. As you approach the Plasmorb, you will hear a buzzing sound that gets louder as you get closer. Wait until the buzzing is at its loudest before pressing the fire button, maximizing the strength at which the Plasmorb will be pushed away from your opponent. If done correctly, the Plasmorb will be pushed with so much force that your opponent will lose possession of it. Then both of you must compete to reach it first and take control. If there isn't enough time to attempt a steal, your next best defense is to get between your opponent and your goalbeams and block the Plasmorb. You must read your opponent carefully and move just as they do, or they will find an opening and potentially take a shot at the goal. It is still possible for an experienced player to successfully perform an angled shot that gets past you. Remember that your Rotofoil will always face the direction of the Plasmorb when it's not in your possession, so it's possible to steal it once your opponent shoots, but you'll have to act fast. This page was last edited on 21 April 2018, at 14:56.